Coffitivity is an app that turns your too-quiet (and frankly pretty creepy) home office into a buzzing coffee shop, only without the jerk who’s hogging the single power outlet all frikkin’ morning after buying one measly coffee. And not even a real coffee. It’s one of those lame-o frappa-latte-chinos or something. 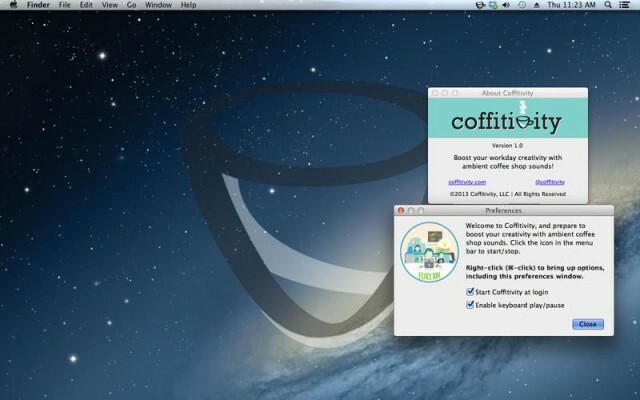 Anyhow, Coffitivity adds a backing track to your office, via a Mac or iOS app. According to the developer, ambient noise boosts creativity. It certainly helps me concentrate: I work way better in busy places than in quiet ones (as long as nobody actually talks to me, like that jerk in the first paragraph will probably do). So Coffitivity provides the ambience of a coffee shop in the comfort of your own home. You can pick between various venues and times of day (lunchtime rush, studious university refectory and so on), and you can even try it out before you “buy” (the app is free) right there on the Coffitivity site. I’m running it from the browser right now and it’s working: I totally want a cup of coffee. And maybe a cookie. Damn. This free app could actually get pretty expensive if I have to keep visiting the bakery downstairs to buy cake.